Albuquerque, NM- New Mexico is the late term abortion capital of America and is drawing women from all 50 states and beyond for abortions through all nine months of pregnancy. Due to this fact Albuquerque is also the protest capital of America because of the sustained efforts of Protest ABQ. 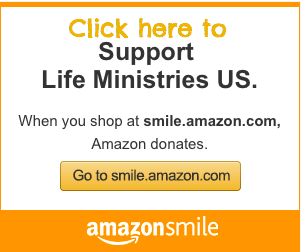 On November 18, 2014 Protest ABQ, along with other major pro-life groups, announced it’s national call to action consisting of two days of protest and the first ever national strike throughout the pro-life community. Protest ABQ has been protesting and exposing those in New Mexico who support, condone and profit from the abortion industry. These protests will continue and culminate to the national protest and strike on January 22-23, 2015. Fr. Stephen Imbarrato, Founder of Protest ABQ is encouraging all like-minded people of conscience to begin their protests now and issued the following statement, “There is no reason why every community across this nation does not begin protesting those who support, condone and profit from the abortion industry today and everyday. In fact, everything I do in my pro-life ministry, I do in protest of pre-born child killing.”These protests should be peaceful and prayerful and ultimately culminate in the national protests and a strike on January 22-23, 2015. Protest ABQ is reaching out to pro-life groups and realizes that together, we must endeavor to promote national protests and a national strike in order for this to send the strongest message possible to our leaders. When “We the People” say that enough is enough and stand up in peaceful resistance to the ongoing slaughter of innocent children, then we will see action and the end of pre-born child killing in this nation.While the national pro-life movement is diverse and we may have different styles and methods of outreach, it’s vital that we stand together in solidarity. “ALL pro-life efforts locally and nationally must culminate with a unified voice and public effort to END our generations greatest injustice…legalized child killing,” stated Bud Shaver, Executive Director of Protest ABQ. 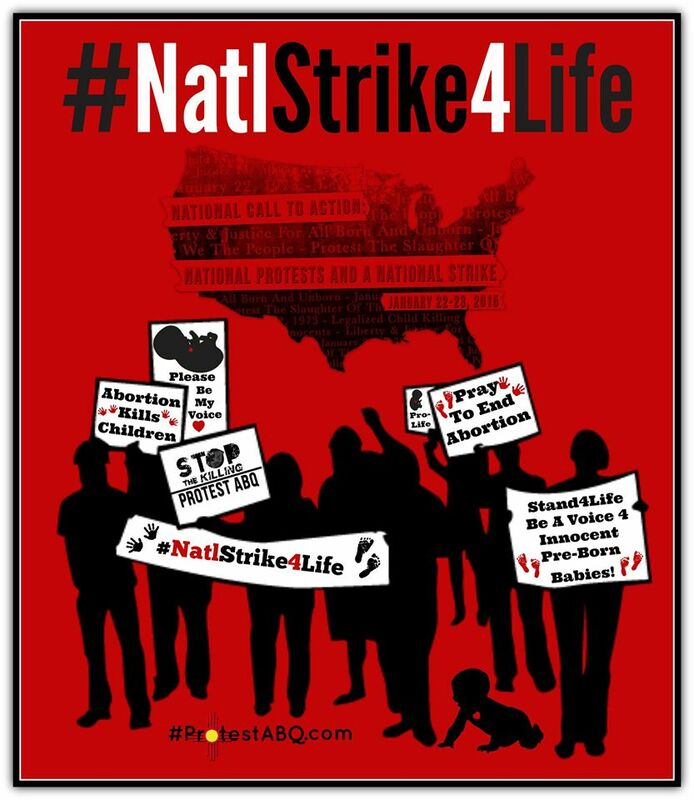 Protest ABQ is encouraging the pro-life community to use the following hashtag on social media to help spread the word about this historic call to action: #NatlStrike4Life. 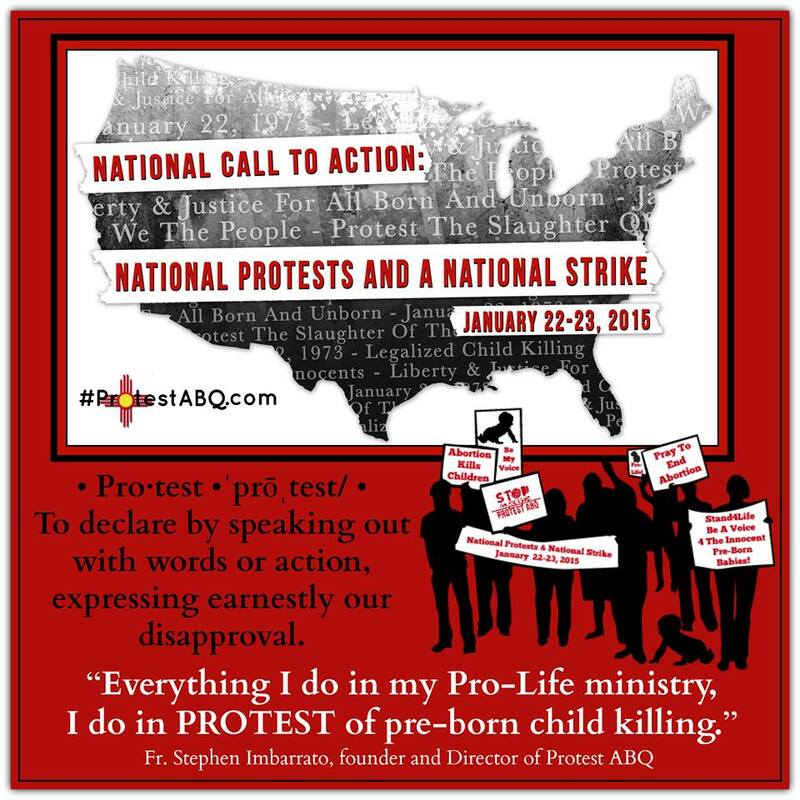 Albuquerque, NM- Protest ABQ is joined by national Pro-Life organizations, including Operation Rescue, Created Equal, and Survivors of the Abortion Holocaust in declaring a national call to action: a National Strike and Protests on January 22-23, 2015. All participants must commit to following the model of Dr. Martin Luther King, Jr. in their protests.”Even if we were to be beaten, screamed at, or abused, we will not respond in kind,” stated Fr. Imbarrato. 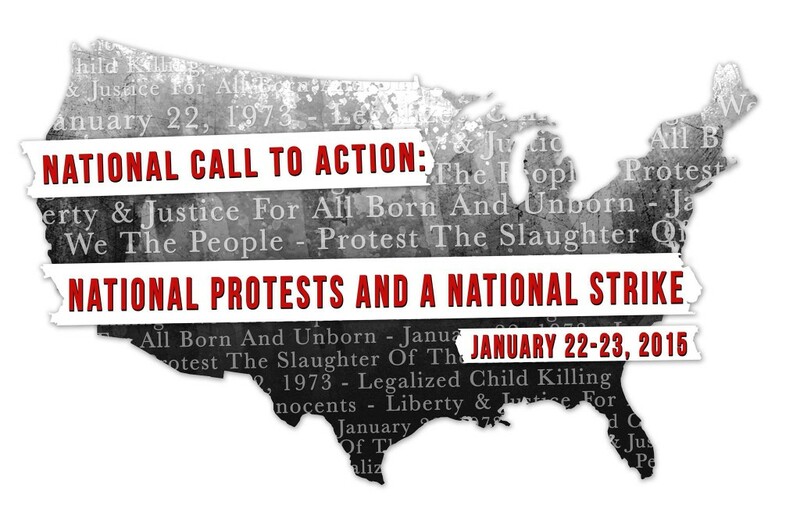 For more information visit www.protestABQ.com and join our Facebook event page: National Strike and Protests on January 22-23, 2015.